Defense Minister hints at major operation during a visit to the Golan. Defense Minister Moshe Yaalon hinted Wednesday that Israel may call up its combat soldiers for a major operation in the near future. 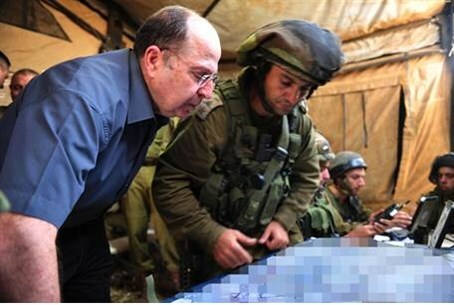 Yaalon spoke as he and Prime Minister Binyamin Netanyahu observed a Golani Brigade drill in the Golan. “I was impressed by the Golani Brigade’s capability, preparedness and skill,” he said. “It’s important to clarify to everyone on the other side of the border who may be planning to harm us in some way, that we are prepared and determined to act,” Yaalon said. Fighting in Syria has spilled over to the Golan on recent occasions, prompting urgent warnings from Israel. “We need the will to break our enemies and to put the fear of death into them,” he added.